Notice why it was formed and its European roots. Look at the ‘Members and partners’ and ‘What we do and how?’ pages on the OECD website (use the tabs on the left to navigate). Who is in the OECD? What does the OECD do? 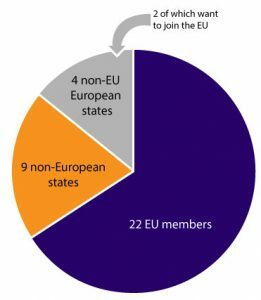 Is the OECD a ‘European’ Organisation? No, but as you have seen it includes a preponderant number of European states and its history lies in post Second World War Europe and the Marshall Plan. Most of the applicant countries and partners of the OECD are non-European states and the focus of the organisation is today very much global. Read more about OECD enlargement. See more of how the OECD cooperates with non-OECD partner countries.